BingoFest is free entry for anyone 21 & up! But, if you want access to the VIP area, you'll need to purchase a pass. To purchase, click on the registration button above. Having trouble? Email Calli Turner at cturner@greaterbentonville.com. This is the party to end the community wide Small Business Bingo competition! Remember- you can pick up your bingo cards starting April 5 at the Small Business Bingo Kickoff at Bike Rack or other at designated locations. Use your bingo card for the rest of the month to visit small businesses and get deals & discounts! Each business is offering a different reward in exchange for getting their sticker on your card. 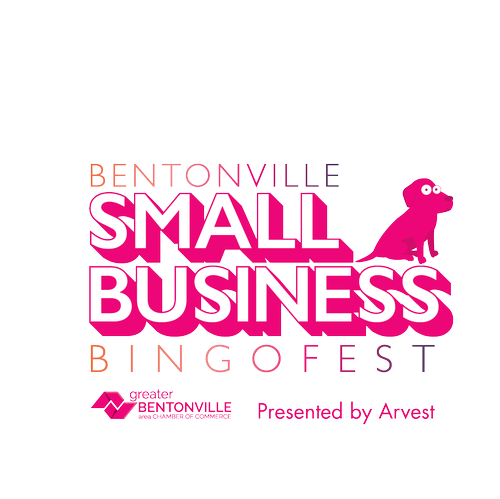 Any businesses inside squares with a circle or star cannot give out stickers until Small Business BingoFest. Bring your card and complete it at BingoFest. Once you've gotten BINGO, you'll turn your card to the designated area to receive a reward and register for MORE PRIZES! You must be present to win. Winners will be announced for the prizes at 6:00pm, 7:00pm and 8:00pm- the Grand Prize being the last to be announced. BingoFest at Record will be free entry for anyone 21 and up. There will be drinks, food, music, networking and a VIP area! Plus, use your wristband when you leave BingoFest to get other deals around the square from participating small businesses. Want to tell people you're going and that you support small businesses? Check out the Facebook event here! Free entry for anyone with I.D.